I have always said I get on better with fanatics who live the way they preach. People who stick to their beliefs and principles deserve some kind of respect no matter how much you oppose their views. Most of them are just unfortunate foot soldiers who are genuine but brainwashed by those who see them as an easy tool to line up their pockets and achieve their lust for power. For me the real scum are those who change their principles as easily as the shirts they wear. In Iran these people are referred to aptly as the members of the "Wind Party". Whichever way the winds of fortune blow, thats where their loyalties will be. There are many of such lowlifes in London. People with no Islamic convictions who like the present status quo and exploit it to the full for their personal gains. They live in the UK and enjoy their personal freedoms that lets them live life the way they want to but at the same time support and promote the Islamic Republic and do business with the mullahs, oblivious to the suffering of the people who have to live under the tyranny of religious dictatorship. 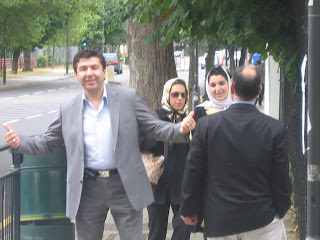 During the last Islamic Republic "elections", we went to the polling booths set up by the Islamic Republic in London. We wanted to talk to the Iranians who still took part in such charades. They fell into 4 categories. Those who worked for the system, like embassy employees, those who were scared that not voting will have consequences for them, such as a young girl who was on medical treatment and thought she would lose her special government currency rate for medical treatments abroad if she did not vote. Those who just needed mental care, such as one woman who said her husband and teenage son told her off but she had come to vote for the "Hidden Imam"! But the last category were the ones we really loathed. Wealthy Iranians living in London, coming to the "polls" in their expensive cars and latest designer gears, with their women wearing heavy make up. Their women would put on a scarf just before they entered the Islamic Centre, and quickly take their scarves off as they went back into their luxury cars. One of those who fell in the last category was the chap shown in the above picture. On that day, he enjoyed the protection of the British police who were using the British taxpayers money to guard the Islamic Republic polling booths in London. The women with him walked behind him pretending their religious convictions by wearing the scarf and the manto. 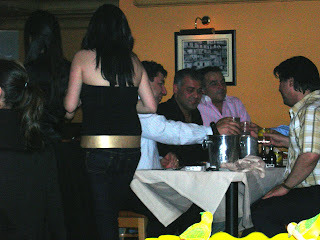 Last night however we came across the same guy, at the Shahrzad restaurant/club in London. Alcoholoic beverages were abundant on his table and the women with him were in no way adhering to any Islamic dress code. All the time I was looking at these hypocrites in the restaurant, I was thinking of the pictures of Hejab crackdown in Iran. I kept imagining the picture of the little boy who was pleading with the Islamic policewoman not to arrest his mum for showing a few strands of her hair. Alarm bells must have started ringing for my companions who recognise the preliminary signs of incredible hulk transformations due to rage and anger in me. My blood was really boiling but sense was talked into me that its best to expose these hypocrites for what they are before they get a chance to change their outer clothing again. One word describes him the best: "SCUMBAG"
Will we be able to see a day where these guys cry when their beloved regime's gone? if there is a regime change, these would be the first to tell their wives to bin their scarves and the Islamic republic flags! This guy is a real affront to the memory of Shahrzad of the Hezaro Yekshab, whose story is a plea to end the mistreatment of women. this is really strange. I received an email today with the link to your report. I was actually there on Saturday. we were sitting the table behind you in the restaurant. I kept thinking I know you from somewhere. so thats what all the commotion on your table was about and thats why your table stood up in the restaurant and sang Ey Iran as they were leaving? These scum bags should not feel secure, while our brothers and sisters are under the yokes of islamists in Iran. These two-bit prostitutes are, as we say in Farsi, members of the WIND Party and the one thing the Mullahs do and do well is sniff out these types of amoral slag; after all, it takes one to know one. I suppose we have to take your word that its the same guy and he is drinking alcohol? The gear they are supposed to wear is called "manteau" a French word which exposes their hypocrisy from the very beginning. I recognise him, he is the head of MESH computers, does a lot of business with the akhoonds in Iran.